According to Beverage Digest, Coca Cola is by far the best selling soda in the United States. In 2013, Beverage Digest reported that Coca Cola accounted for over 17% of the carbonated soft drink (CSD) sales in the country, which is almost double that of its closest competitor. According to CaffeineInformer.com, as of 2013, the top eight best-selling brands of soda in the U.S. have been the same for several years, and all are made by the three beverage companies with the highest market share, as reported by Statistia.com. Individual CSD percentages are as reported by Beverage Digest. The last big shake-up in the list of top sodas in the U.S. occurred in 2010, when Diet Coke inched past Pepsi-Cola to become the second best selling brand, according to USA Today. While The Coca-Cola Company occupies the top two spots, it has only three sodas in the top eight, while PepsiCo has four. Even though they don't own the top two selling CSD beverages, PepsiCo's earnings significantly outpace The Coca-Cola Company's. In 2013, PepsiCo reported $66.4 billion in revenue, while the Coca-Cola Company reported $46.9 billion. Dr. Pepper Snapple's earnings are way behind The Coca-Cola Company and PepsiCo, reporting revenue of $6.0 billion for 2013. 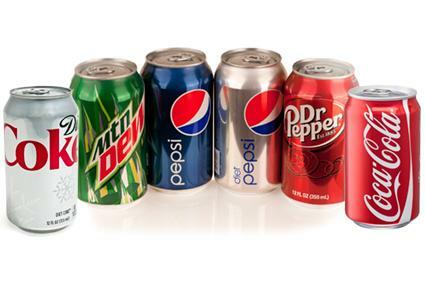 Caffeine Informer suggests the fact that three diet sodas occupy positions within the top eight soft drinks indicates the increasing popularity of sugar free beverages. Soda sales overall are declining. According to AdvertisingAge, consumers are increasingly switching from soda to tea, energy drinks and bottled water, even in the face of significant spending on advertising by soft drink companies. ABC News reports that the decline in soda sales may be attributed to consumers' desire to stay away from sugary soft drinks for health and diet reasons, paired with concerns over the safety of artificial sweeteners used in sugar-free sodas. Even with the overall decline, AdvertisingAge points out that soft drinks continue to hold a 43% market share in the single beverage category, which is significantly higher than any other type of individually packaged beverage. Controlling the soft drink industry - even in light of declining soda consumption, is big business with big dollars attached to it. As new options are developed and introduced to the market, there may be a change in the brands at the top of the CSD category.